“Do you have a cold?” ask the worrisome and retreating. A flustered voice calls out from behind a flurry of waving white tissues “no, it’s just allergies.” A muffled snort punctuates the words. Hands are neither extended nor shaken. That’s me, in case you haven’t figured it out, sinus passages inflamed and all. There but for the grace of God go I in a fit of sneezing and hay fever. This time of year, most people are enjoying the dunking and soaring flights of NCAA basketball players ala ‘March Madness’. In my house this March, there is also madness and dunking, but of another kind. Slam dunk go the crumpled tissues heavy with snot, and hopefully, clear mucous. Metaphorically speaking, its spring and the colors of autumn are not welcome. My watery dry eyes sting. My throat tickles from post nasal drip. My lips and nose are chapped raw from being rubbed the wrong way with an assortment of 2-ply paper products. Wads of tissue dot the landscape of my apartment. 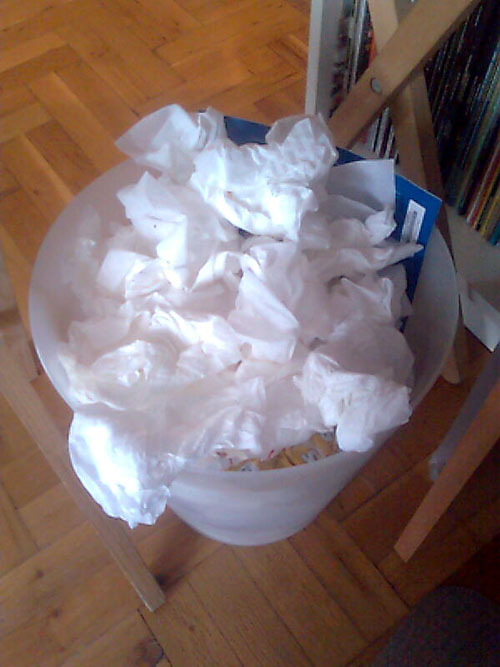 My waste basket runneth over with Kleenex. White specs of paper flakes cling to my dark t-shirt like dandruff. I breathe heavily in rasps of throat clearing coughs (ahem ahem). My ears ring. OK, well my ears usually ring anyway, but that’s another story. Have you ever lied in bed with cotton jammed up both nostrils in an attempt to dam up the gorges of viscous nasal secretions from dampening your pillow? I have. In moments such as those, I’ve pondered the mystery of how it is that my challenged proboscis could be both stuffed and runny at the same time. I’ve seen the doctors. I’ve been told that I have a highly advanced and evolved immune system (quack quack). Such is my sensitivity that I can react to airborne pollen and dandelion root wafting in the breeze from a mile away. There is no cure; only occasional relief in the form of pills, sprays, and shots … each complete with various caveats written in small print. Yes, I’ve tried the medications. Honestly, I prefer the older ones that make you tired and weary eyed. It’s a small consolation that they help slow the world down just a bit. It’s OK though; I don’t operate heavy machinery. Thanks for asking. The pharmaceutical companies really know how to rub it in and prey off of their customer’s misery. They publish websites with pollen counts to ‘help’ the afflicted know when it’s time to fork over their money. They’ve got a good thing going and they know it. Allergy suffers are the worst kind of druggies. Throughout the year, crates of pills are washed down phlegm lined gullets in the name of relief. For me, popping pills is a way of life before and during allergy season, and even after the end the season has ended just to combat the eventual relapse that ensues. Oh yes, try to wean yourself off the medication and your allergy symptoms return with a vengeance… and like Charles Bronson , this time their pissed! 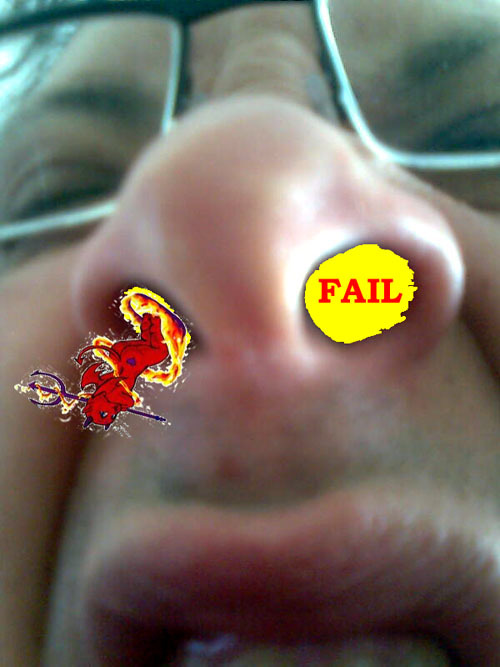 Now, the Bible relates that when man was created, God blew life into his nostrils. I’ve heard it said that in ancient times people actually died from sneezing; they would literally blow their souls right out of their noses. 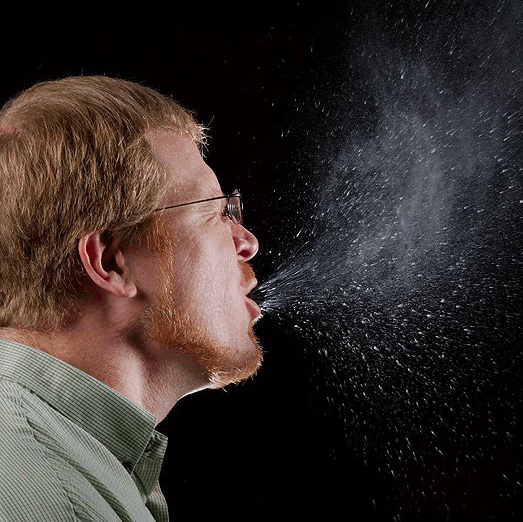 Most likely, this is one of the origins of blessing a sneeze with ‘God Bless You’. Trust me, at the height of hay-fever season, I can relate. Here’s another tidbit that is nothing to sneeze at: according to folklore, saying ‘God bless you’ is also a way of warding off the Devil who sees a sneeze as an open opportunity to invade your body through the nasal passages. Poor Devil. Talk about having a crappy job description! So for all you allergy sufferers out there, like me, who have already begun to talk like Daffy Duck, I send you both my condolences and best wishes for a hearty ‘Gesundheit’. PS. Thanks for reading. Do you have seasonal allergies? Can you suggest any ideas for relief? Has wiping Vaseline around the edge of your nostrils to trap pollen worked for you … or do you just do that for kinks? Either way, let me know. ← Lizard Vision: The Eyes Don’t Have It.